Meetings are held the 1st & 3rd Tuesday each month at 7 p.m. On the 3rd Tuesday a potluck supper is served prior to meeting at 6:30 p.m. September - April. May-August meetings are held once a month, dates and times will be posted to the website. You can recycle and suport the West Gardiner trails by donating your cans and bottles in the marked box at the West Gardiner Transfer Station. This site is continually updated, so check back often. It’s a tool to serve our club and community. Any suggestions or comments are appreciated. Tuesday, April 2, 2019 at 7 p.m.
​Tuesday, April 14, 2019, potluck supper at 6:30 p.m., meeting to follow at 7 p.m.
LANDOWNER APPRECIATION SUPPER: Saturday, April 27th, 5 - 7 p.m. Menu: BBQ consisting of hamburgers, hot dogs, salads, desserts and drinks. As a thank you to landowners for allowing us to use their land for our trails, we will hold a Landowner Appreciation Supper for landowners and their immediate family. If you are a landowner, plan to attend. Members are also encouraged to attend. To help us plan for food, please RSVP with the number attending to Charlene, 582-7239 by Wednesday, April 24th. Volunteers to help with the supper would be appreciated. 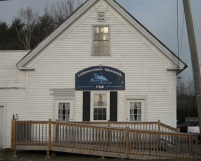 On February 10th, we hosted a 50th anniversary celebration at the clubhouse. Former and current members were served a delicious luncheon and browsed through the memorabilia of the past 50 years that was on display. Was interesting talking to the members from the early days of the club, many stories were shared and reminisced about days gone by. In talking with these folks, this is what we do know. The club has the same values as it did when it was started in 1969 and that is to stay a family oriented club, respect our landowners and support the sport of snowmobiling in West Gardiner and points beyond. Yes, the machines and trails have change a great deal and most of us have stories of the “one lungers” and our first sleds which always brings a fond memory of days gone by. We look forward to the next 50 years. Snow for riding was slow to arrive, once it did, we experienced some great riding. To all who helped prepare the trails, from bridge repair/rebuilds, clearing brush, signage to grooming – many thanks. Our trail system is amazing thanks to these hardworking individuals. Many thanks also to those who helped in other ways: breakfast crew, 50th anniversary celebration, hot dog roasts, town meeting displays, landowner liaison/contacts and everyone who helped in any way to make this club what it is today. ​Information signs which have a map of our trails have been posted at all major intersections & Welcome to West Gardiner signs with maps have been posted where neighboring trails connect to West Gardiner. Welcome to Cobbosseecontee Snowmobile Club Trails sign and our map posted where local trails (Gardiner, Farmingdale, Hallowell, Litchfield) join our local trail. Informational/Directional Signswith club map posted at all major intersections.